Detail Photo Shows Welded Bracket Construction to Support Safety Railing. -Designed with corner brackets welded to the counterflashing for easy assembly and installation of the safety railing in the field. -Roof hatch with railing is sold as one unit. Material: 14 gauge galvannealed steel. Finish: Gray textured powder coat paint. Curb: 12" single wall curb with 3-5/8" wide flange with holes for securing to roof deck. Cover: 14 gauge galvannealed steel, with 22 gauge galvanized steel liner. EPDM gasket seal. Insulation: 1” Fiberboard insulation in curb and 1” mineral wool in cover. Hardware: Heavy-duty hinge, pin and fastening hardware are zinc-plated steel. Heavy gauge, automatic hold-open arm with red vinyl grip for opening and closing. Spring: Counterbalanced spring(s) in cylinders for lift assist. Latch: Zinc-coated exterior and interior handles with interior and exterior padlock hasp. 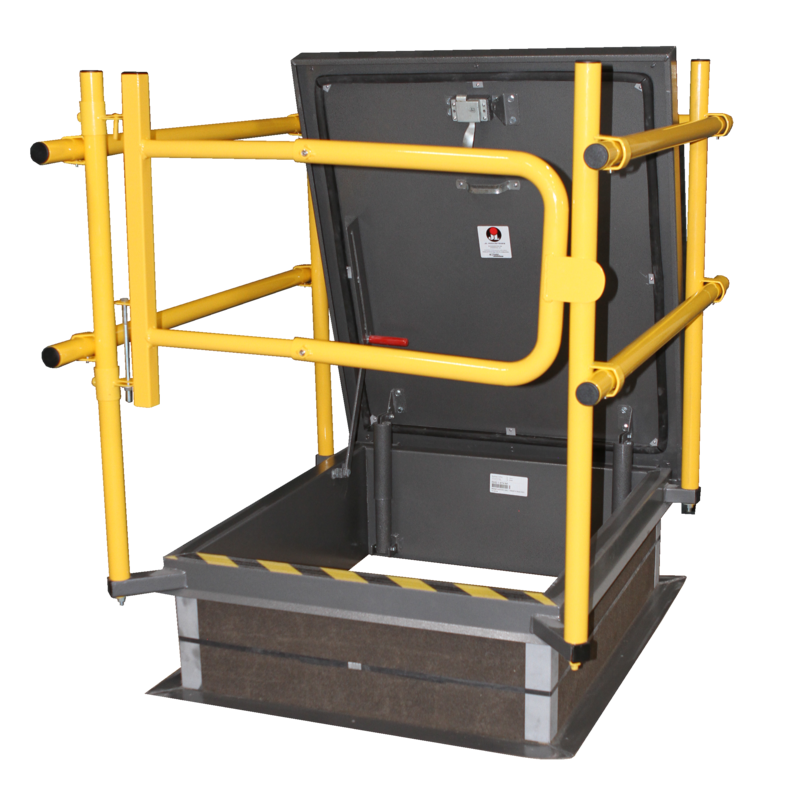 Load/Deflection: Roof hatch cover has been tested and approved to support a minimum live load of 40 lbs/ft² with a maximum deflection of 1/150th of the span, maximum negative load of 50 lbs/ft² wind uplift, and 110 mph wind load when cover is in upright position. Certifications: When ordered with optional rigid gate, the railing meets OSHA 1910.28 requirement for safe egress and ingress through rooftop hatch openings. Material: 1.66” O.D. galvannealed steel tubing. Finish: Safety yellow powder coat paint. Hardware: Zinc-plated steel nuts, bolts and washers and 3/16” ASTM proof coil chain with hoops for securing.